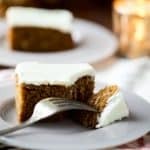 This gingerbread cake with cream cheese frosting is healthier than most gingerbread cakes, but don’t hold that against it! 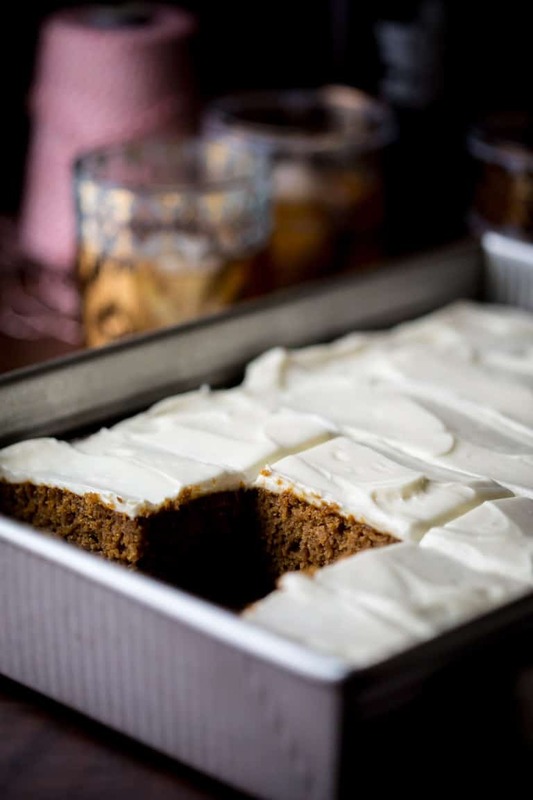 It is ultra moist, soft and spicy and the creamy (lower-calorie) frosting is amazing with it! It’s a great recipe to serve a crowd at Christmas time, because it serves 18 people! Friends I think I may have outdone myself this time. Pat pat pat. That’s the sound of me patting myself on the back for this recipe. Backing up though, I do have to eat a bit of humble pie or crow or whatever. Cake. You know how over the last 12 months every Monday I have been sharing old recipes? That’s okay if you haven;t noticed. I still want to be your friend, and we can still hang out and cook together. Well, anyway. 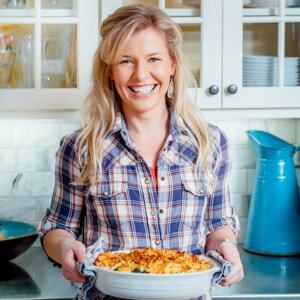 I have well over 600 recipes on this website, and a bunch of them are quite old and outdated. Nobody has been appreciating them because they are lost in the deep dark depths of the archives. So every week I’ve been refreshing one of those older posts. 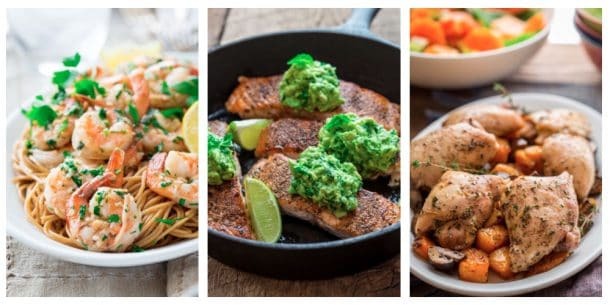 You know, great recipes, that seem particularly deserving of seeing the front page again. They’ve one by one been getting all fancied up for everyone with new photos. Want a good laugh? 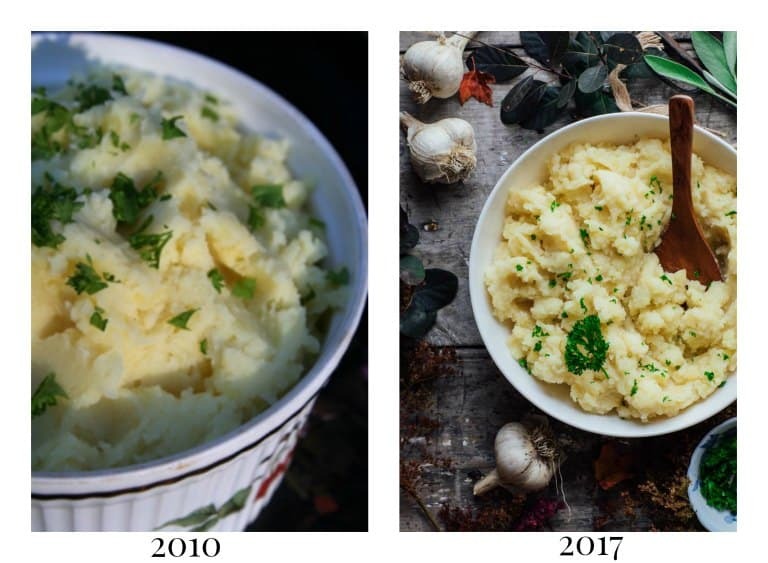 See below the before and after of my favorite healthy roasted garlic mashed potatoes– it’s one we shared earlier this fall. Anyway, I have been so happy to revisit all of these recipes over the last year. I have fallen hard again for several of them. This soup in particular is even better than I remember! But it was the gingerbread cake that totally threw me off. I remember it one way, but when I went to make it to take new photos, man was it disappointing! It was so dense you would need to drink an entire quart of eggnog to wash it down. I have no idea what I was thinking publishing that. I guess back then when I had 2 readers (my mom and my 2nd grade teacher) I wasn’t too worried about that. Well now adays, there are more than two of you and I know you all count on me to make the recipes awesome, so I knew I had to refresh this one in a major way. So I totally scrapped it. I started fresh and tested and re-tested. And tested some more. I tried gluten-free flour, granulated maple sugar, and varying degrees of eggs, oil and molasses. It took a while and thankfully my neighbors helped with taking care of eating the multiple cakes (did I mention one batch of this gingerbread cake makes 18 servings!) 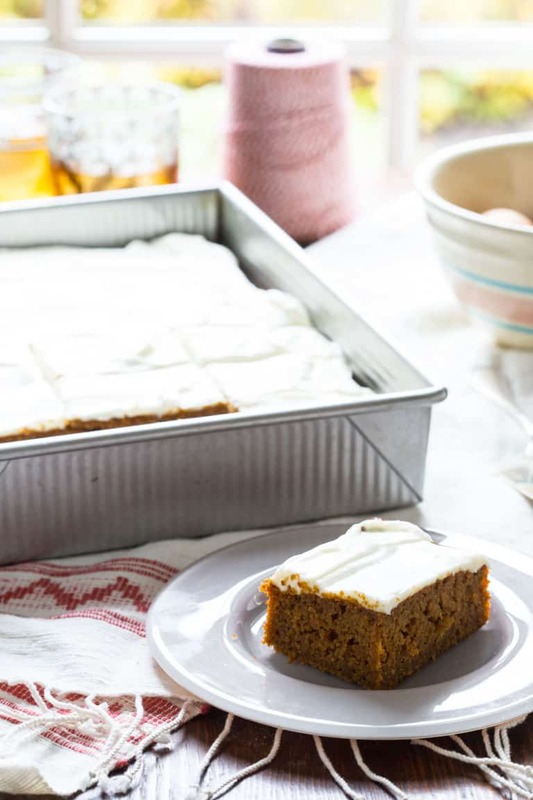 Makes me wonder what it was like to develop these gluten-free pumpkin bars, the recipe makes 40 bars! I would need a bigger neighborhood! And now, I am so proud of the results. It is dark and rich and complex while still staying true to my healthier parameters. I just love this cake friends and I really can’t wait to start getting the reviews back from you all! Please make sure if you try it to come back and leave me a comment and rating! Okay? I used avocado oil instead of butter in the cake. It gives it a very tender cakey crumb. I used dark pure maple syrup to sweeten the recipe. 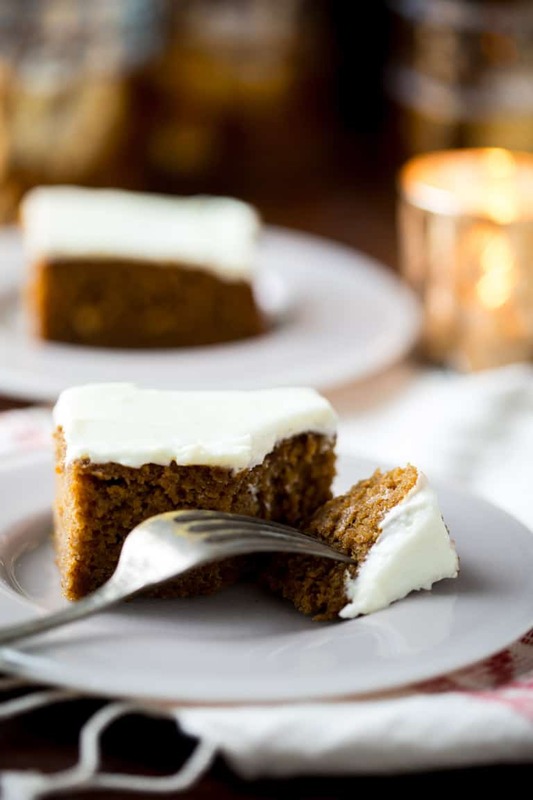 It really makes the cake very tender and moist and gives it richness. I replaced some of the fat with applesauce. This keeps the cake very moist as well- are your noticing a trend? This cake is moist!! I used dark coffee (cold) in the batter too. It adds a subtle richness that you would miss if it wasn’t there, but doesn’t give the cake a super strong coffee flavor. 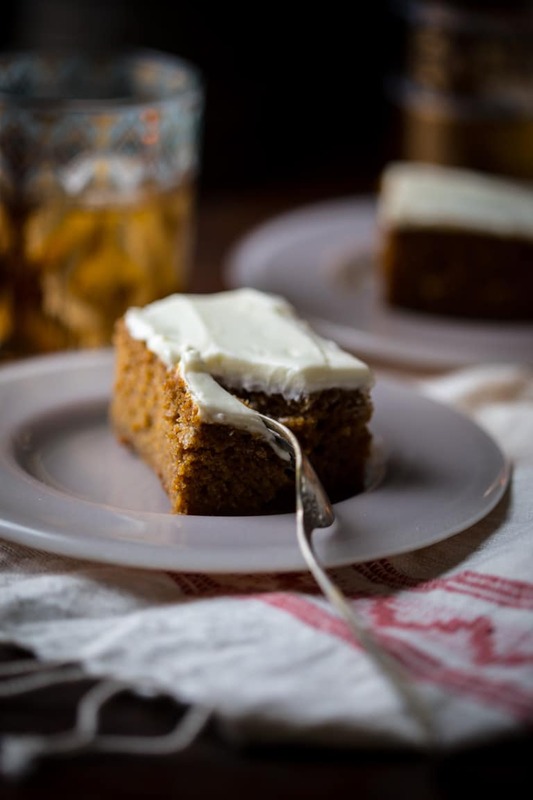 The molasses gives the cake classic old fashioned gingerbread flavor. I used Grandma’s Original Unsulphered Molasses. Both molasses and maple syrup have trace minerals. The cake is made with white-whole wheat and some ap-flour for structure. Note, using a liquid fat means that the batter is very easy to make, because you just stir the ingredients together. In order to keep the batter from becoming lumpy, I found that whisking alternating wet and dry ingredients into the egg and oil mixture worked really well. I used Erin’s cream cheese frosting that she serves on her pumpkin cupcakes as a guide for the ratios. But she used full-fat cream cheese. So I went on the heavier side for the butter. 4 tablespoons. Still much lighter than many frosting recipes! But the flavor is amazing! The key to getting really good texture for the frosting is to soften the butter completely before you begin. Our house is cold at this time of year, so I learned this the hard way. Beat the butter with the paddle attachment in your mixer until it is smooth. Scrape down the sides! Then add in the cream cheese (also softened.) Scrape again. Then beat again. This ensures the butter will be completely mixed into the cream cheese. Next add the powdered sugar and beat on low until it is combined. Then beat on high until the frosting is completely smooth. For good measure scrape the bowl one more time, then beat again. You won’t be disappointed. 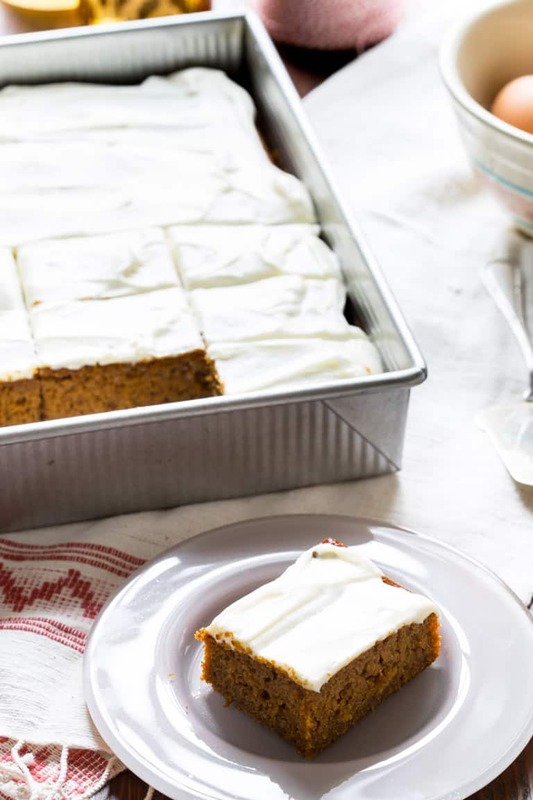 This frosting is smooth, tangy and creamy, and the perfect foil to the rich spicy cake. Have you ever gone back to look at your work and been surprised by what you found? Do you ever bring cake to your neighbors? 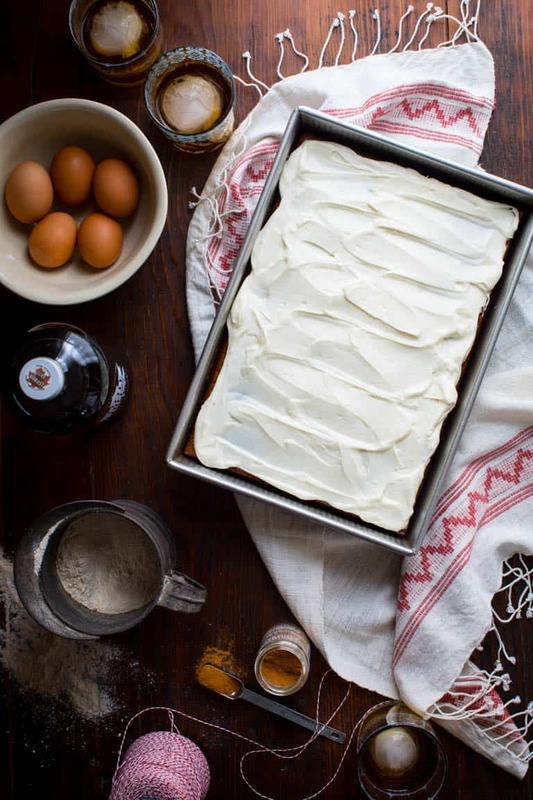 Have you made cream cheese frosting with reduced-fat cream cheese? 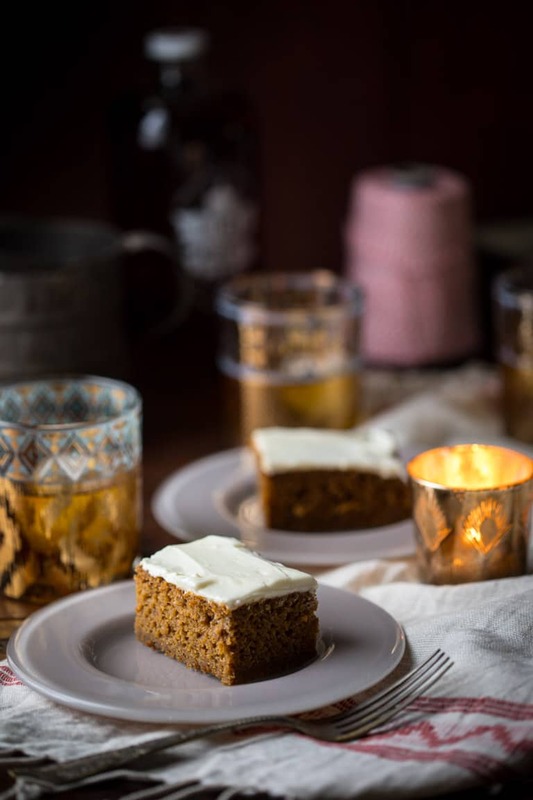 This classic tasting, rich and moist gingerbread sheet cake gets a healthier make-over with applesauce (in place of some of the fat), whole grain flour and it is sweetened naturally with pure maple syrup and molasses. The cream cheese frosting is made with reduced-fat cream cheese! It serves a crowd (18 servings) so it is perfect for a Christmas party! Preheat oven to 350°F. Coat a 9 by 13-inch baking pan with cooking spray. Whisk eggs, applesauce and oil together in a large bowl. Whisk maple syrup, coffee, molasses and vanilla in a large measuring cup. Whisk whole-wheat flour, all-purpose flour, baking powder, ginger, cinnamon, salt, allspice and cloves in a medium bowl bowl. Whisk about 1/3 of the flour mixture into the applesauce mixture until smooth. Add about 1/3 of the maple syrup mixture to the applesauce mixture and whisk until smooth. Continue alternating and whisking in two more additions of each mixture until the batter is smooth. Scrape the batter into the prepared baking pan and bake until the top springs back when lightly touched, 33 to 35 minutes. Let cool, at least 1 1/2 hours. Beat butter in a medium bowl with paddle attachment on medium speed until smooth. Scrape sides of the bowl and beat again. Add cream cheese and beat until smooth. Scrape sides and beat again. Add powdered sugar and beat on low until incorporated. Scrape sides and beat on high until completely smooth, about 1 minute. Spread the frosting over the cooled cake. Can be made 1 day ahead. Store covered with plastic wrap at room temperature for one day. Refrigerate left-overs after 1 day. 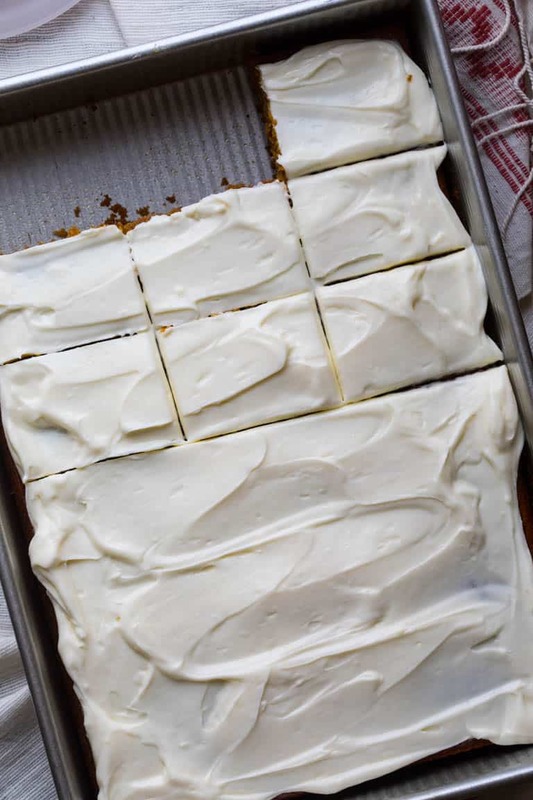 I love that you used applesauce here and that cream cheese icing looks absolutely irresistible! The applesauce addition was one of the hold-overs from the original recipe. I love how moist it ended up, and that surely contributes. I’ll be making this for Christmas dinner dessert this year~! That is so great to hear Sharon! I really hope you love it! I was so surprised that the original gingerbread was nothing like I remembered. Good thing this re-make is so good. Redemption! Ha ha. I just made another one from the archives this week- and thankfully it was great. Phew. Let me know if you do make it Deanna. I’d love to hear what you think. Oh my goodness – this looks so good! I’m only having 4 for Christmas this year, so I might just scrap the Christmas cookies this year and enjoy this instead! Thanks so much Anne. It’s just four of us on Christmas Eve too, so I too am trying to figure out a creative excuse to make this cake again. Ha ha. This looks so amazing! I’m going to try this! Any suggestion for a garnish on the top to make it “party pretty”? Maybe just a sprinkle of cinnamon or something like that? I like that idea a lot. Some other ideas are: you could do shaved dark or white chocolate curls, or melted white chocolate and dark chocolate drizzled over it. Or chopped candied ginger. Depending on the event I think it would be really fun to do some sort of fun holiday candy nonpareils. If you look in the baking section of craft and or party stores they often have cute options- like mini snowflakes. I’m so psyched you’ll be making this. I am so in love with this cake and I am so happy to be sharing it with everyone! I’m chuckling because I have gone back and looked at my old work and have been horrified! At any rate, I just found your site and I LOVE it! 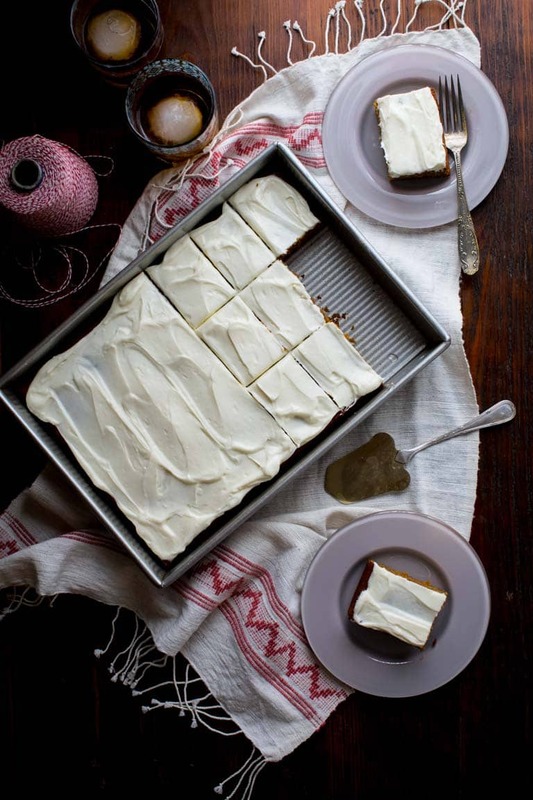 I am a gingerbread freak lately, so this recipe comes in super handy. Have you ever tried putting diced candied ginger in gingerbread? Just curious. Thanks! I love candied ginger too. 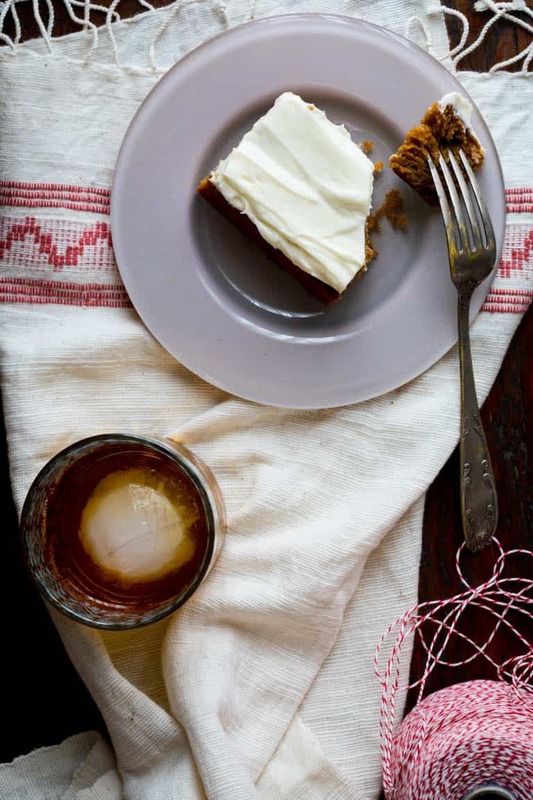 It is fab with gingerbread and molasses recipes. So glad you came by Elizabeth. Have a great day. I’d love to make this cake for the upcoming winter season! That’s great to hear! Thanks so much. You can try it for sure Lynette. I would go for one of the cup for cup/measure for measure style flours for the best texture. Could this cake be “flipped” out of the pan and onto a serving platter so all sides can be frosted and decorated? Or is it too moist? Looking to make it “Party Pretty” as another commentor put it. It is not too moist. To do so without breaking it: Cool it completly and use a flat baking sheet to invert it onto. Lay the baking sheet on top of the cake pan. Hold on to it with both hands, then invert. Because the sides will be sloped slightly the wrong direction, then you’ll want to carefully do the same back onto a serving platter. Double the frosting to cover the sides. I love this! I’m tempted to try this in a sheet pan so I can get more slices but chances are it will not be as moist. Curious if you tried in a sheet pan? Hi Angela. I did not try it, but I am tempted to try it myself now that you say that! I think it should work without drying out, as long as you keep an eye on it and don’t let it over-bake. Not sure on the timing. To check it, make sure it has risen all the way across the surface. Then gently tap the center surface of the cake with your finger tips to see if it is set up. If it deflates give it a few more minutes. If it springs back, pull the pan out and do a toothpick test. Please let me know if you do try it. I am so curious now.